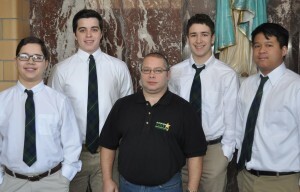 Notre Dame High School (NDHS) in Clarksburg is being honored for its Irish Online Network (ION). The program has been nominated for Best New Student Broadcast Program in the country by the National Federation of High Schools. ION broadcasts NDHS sports, academics and other school functions. Pictured from left to right are ION crewmembers Michael McAra, Alex Altenburg, Reuben Perdue, Andrew Rogers and Christian Palmer. The group has completed more than 50 broadcasts since August 2015.